ShipWreckIslandStudios.com: "Harem Scarem releases another true masterpiece, one that should put them on the worldwide map." Heavy-Metal-Heaven.de: "Sounds like Great Eighties Hardrock! I love it..."
Rockreport.be: "THANK and Hail to the gods of AOR/Melodic Rock that Human Nature is back in the old HS groove! WELCOME BACK HARRY AND CO!!!" AORHeaven.com: "Yes, this time they have really gotten closer to the sound of Mood Swings, yes you can take my word for it!" Rock Hard Germany: "Again the Melodic-Rockers from Canada deliver shining and brilliant hooklines on Human Nature. HAREM SCAREM simply know how to rock!" Myrevelations.de: "Powerful refrains and a Mörderballade wie 'Hanging On' sind immer noch ein Kaufgrund neben anderem gutklassigen Material!" Getreadytorock.com: "In fact this is probably the band's best album since 2002's Weight of the World!" Metal Zone: "This cd is again a brilliant release of Harem Scarem!" Blast Magazine: "Human Nature will be a must have for all Harem Scarem fans!" Heavyhardest.de: "Great musicians and a genious of a singer bring in the first highlight of 2007. That's a big shot!" Rocktimes.de: "Human Nature will fully satisfy every rockfan, which means that this release is 45 minutes full of high class melodic rock for every rockfan's cd shelf. But it won't stand there for long, because you will keep it spinning in your player on and on and...!" Metallic-Zine.de: "As Overload could convince me last year, the eleventh album of the Canadians is again full of refreshing hardrock in the purest sense!" FFM-Rock: "A really groovy melodic hardrock album that deserves the rating 'only Killer, no filler!'" Forgotten-scroll.net: "This is definitely an album tailor made for all the Harem Scarem fans and all the people that love classy A.O.R. and melodic rock played with attitude!" Metal-inside.de: "if you are looking for a really sophisticated piece of music - here you are!" Home Of Rock: "A must-have for all the fans but also recommendable for newcomers!" Melodic Hard Rock & AOR: "At The End Human Nature seems to been a perfect follow up for Harem Scarem and will send the group a step forward!" Metalearth.de: "With Human Nature the four Canadians try to get back to their roots - and it works!" Extendedmix.com: Human Nature is fighting for the title Harem Scarem's best album ever, and that is under a period of very much work for Lesperence and Hess, with, among others, Canadian Idol... Extremely strong to cope focusing on their own work in such a brilliant way like Human Nature is!" Medazzarock.ch: "numerous bands would kill their grandmother, if they were in return able to write such catchy tunes like HAREM SCAREM do!" 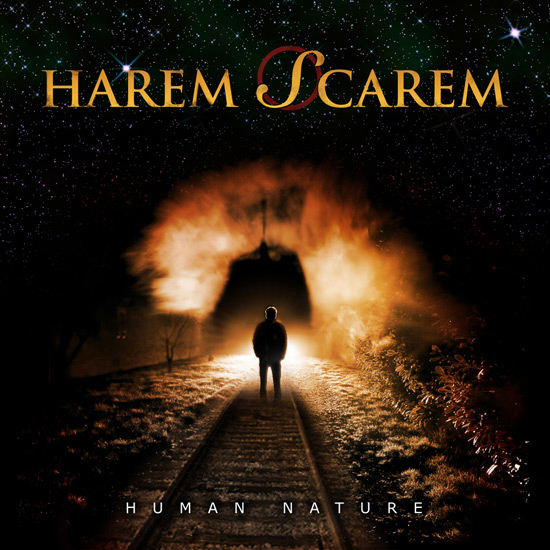 Metal-Experience.com: "with Human Nature Harem Scarem impressively get back to the melodic rock stage!" Musix: "wonderful melodies, perfect harmonies, superb choirs and choruses!! The exceptional quality Harem Scarem fans are used to!" Eclipsed Magazine: "With this album the Canadians underpin their cult status!" Metalspheres.de: "Harem Scarem deliver 12 flawless melodic rock hits on Human Nature!" Music.ch: "intuitive melodies, fat choirs and a guitar work that really rocks – Human Nature must be a pleasure for every AOR-fan!" Osnametal.de: "I am totally convinced by Harem Scarems work on their new album!" Rocksensation.de: "Another masterpiece! You have to listen to it!" Vampster.com: "perfect songs with strong guitars and elaborated hook-lines!" Metal-district.de: "a high-class and very contemporary album made to proof the well-deserved status of Harem Scarem!" Squealer-rocks.de: "Harem Scarem anno 2007: Buying order! Error impossible!" HMbreakdown.de: "the new album captivates with perfect guitar work, wonderful melodies Harry Hess in top condition!" Collider.com: "Human Nature is a fantastic place to start if you are just beginning your journey with the band, but lovers of great melodic rock should also seek out the band's self-titled debut, Mood Swings and Higher. I promise you won't be disappointed!" RevelationZ.com: "anthemic melodic rock, powerful guitar motifs and inviting hooks"
Rockeyes.com: "Human Nature is just another incredible release from Canada's best!" "Big John" John Patrick/Radio Caroline: "I do admire their attitude of going in their own direction and doing what they believe in." Hannes Lehnhard/Ecorder.at: "Harem Scarem is full force. The new album is one of their best ever!" Rock Hard Germany: soundcheck: January, rank #3! Rock it! Soundcheck: January/February, rank #4! Melodicrock.com: best of 10 albums 2006!